Our mission is to contribute to the conservation of our earth’s animals, plants and other natural resources by challenging ourselves to act as responsible environmental stewards. But we cannot do it alone! Implementing green practices into your life can help reduce waste, conserve natural resources, and protect ecosystems and biodiversity. Project Piaba is a non-profit organization which studies and fosters an environmentally and socially beneficial home-aquarium fish trade. Can't find the RSPO label? Look for the Green Palm label! This label indicates products in support of the transition to certified palm oil. 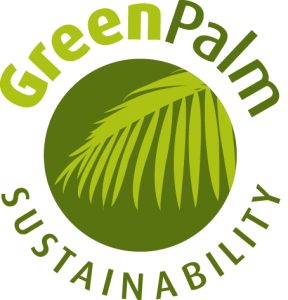 Proceeds from Green Palm certificates help growers fund the transition to sustainable palm oil. Make things even easier by downloading the Cheyenne Mountain Palm Oil App and find out if a product’s palm oil came from a sustainable or a non-sustainable source. A quick search by product, brand, or barcode will let you know how rainforest-friendly your product is! As US trade policies and regulations change, more beef may be imported from Brazil. Since cattle ranching is a major contributor to rainforest destruction, as rainforest is cleared to create pasture, purchasing local grass-fed beef is a better choice. make an impact and protect wildlife. And remember, each time you visit Roger Williams Park Zoo, proceeds go towards conservation efforts locally and around the globe! 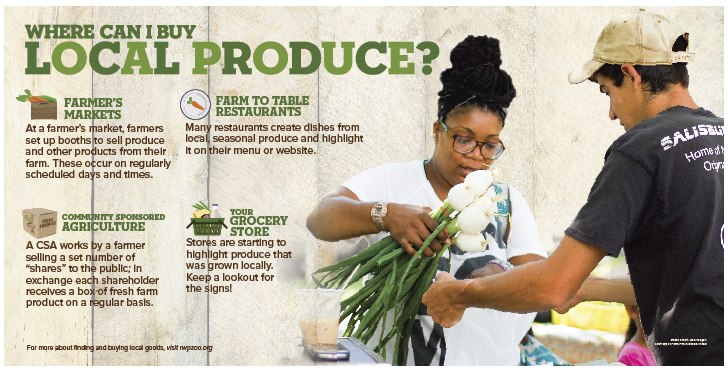 Buying food products in your community helps reduce pollution caused by shipping products. It also helps to build your local economy. The Zoo's Alex and Ani Farmyard, designed to look like a typical Rhode Island farm, celebrates the diversity of farms found around the state. Click HERE to explore this exhibit. Here at the Zoo, we don't offer straws with drink purchases or plastic bags with gift purchases. Disposable items like plastic straws and plastic bags are extremely harmful to wildlife, including our ocean friends like the Zoo's harbor seals - Action and Bubba. Use reusable bags and forgo the straws and other plastic items that end up our oceans. 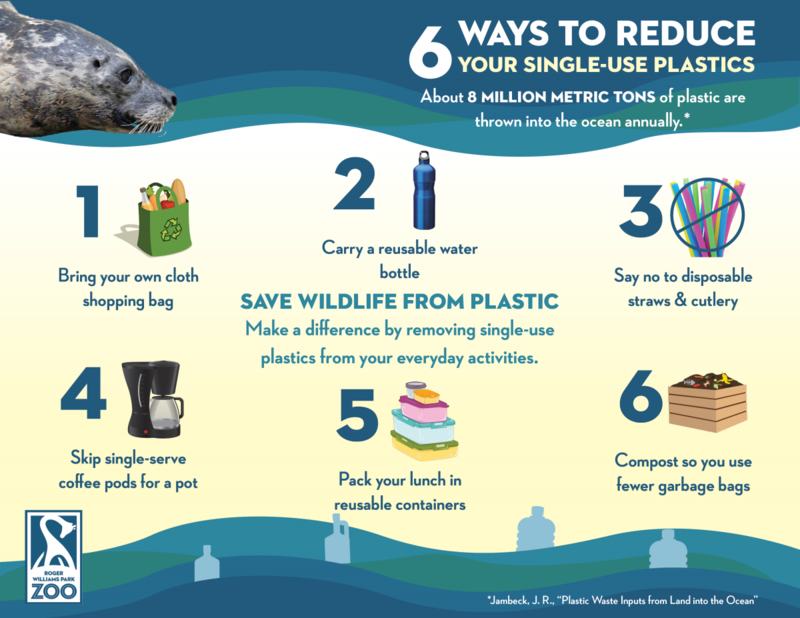 Let's keep these plastics out of landfills, and out of the environment where wildlife can accidentally ingest them - Together we can Punch Out Plastics! Say no thank you to straws and other single-use plastic items. Compost yard waste and kitchen waste and use it to feed your yard. You’ll put less matter in the landfill while nurturing your plants naturally. Don't know where to start? Find useful tips or buy a compost bin from RI Resource Recovery. Or try vermicomposting - worms, can naturally convert organic waste into fertilizer! Donate reusable items such as clothes, furniture, electronics, etc. Don't buy new! Instead shop your local consignment/antique/thrift stores for some neat finds. Amphibian species are disappearing at an alarming rate across the globe due to a number of factors such as habitat loss, pollution, and disease. As a citizen scientist with FrogWatch USA, you can help save our frogs! FrogWatch trainings cover the importance of amphibians in the environment, how monitoring our local population helps to protect them, factors to consider in choosing a site to monitor, how to tell frog species apart by their calls and how to report findings to FrogWatch USA. Become a citizen scientist with FrogWatch USA today. Does your family want to save wild animals and wild places? Become an Eco Agent and spend Spring helping Roger Williams Park Zoo inspire your neighbors to make the world a better place for animals and their habitats. Eco Agents are families who will organize and host an event in their community to share simple ways to help our planet. Roger Williams Park Zoo will provide everything needed to get started! It’s simple! Attend the inaugural event at the Zoo on April 7th & host an event in your community between the dates of April 20 - June 8. This program is limited to 20 families, so be sure to apply early. Application period is closed. If you are interested in applying for this program please contact Programs@rwpzoo.org. Questions? Please contact programs@rwpzoo.org or call (401) 785-3510 ext. 358. If registering online is not possible, you may use the Mail-In Application Form.